It’s July, so where’s the revolution? I first published this post two years ago. However, yesterday, the 19 July, was the Barcelona anniversary of the military uprising whose failure led to the Spanish Civil War (the mutiny starting in Morocco on the 17th), so I thought it was appropriate to bring this post to the fore again (19/07/2014). July is nearly over and I can’t help wondering where the fireworks are? While popular images of the Spanish summer include blasting hot days, clear skies, greasy paella and treacherous sangria, it is worthwhile remembering that Barcelona was also a key city in the development of Anarcho-Syndicalism – the tying of Anarchist thought into a cooperative structure. It is in fact the sole place in the world to have enjoyed an Anarcho-Syndicalist government of any kind, as related in George Orwell’s Homage to Catalonia. And it all started in July. July is a key month in Spanish history. Traditionally, you either start a revolution or go to the beach. During the First Spanish Republic, back in July 1873, there was Cartagena’s Cantonal Revolution and Valencia’s Petroleum Revolution. 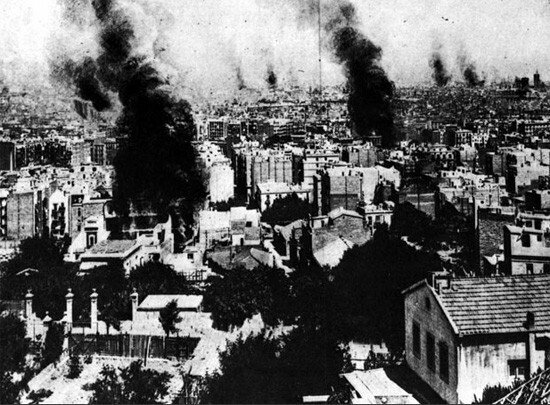 Then in 1909 came what was known as the July Revolution, an Anarchist-influenced worker uprising in Barcelona, dubbed la setmana tràgica, or “tragic week”, by the bourgeoisie as they saw their opulent Modernista world tilt dangerously and their churches set on fire. The infamous uprising of 17–19 July 1936 saw General Mola’s failed coup develop into the three-year conflict of the Spanish Civil War. Sparked off by the coup, an ensuing worker revolution was decisive in foiling it, resulting in Catalonia’s revolutionary government which lasted until the Communist mid-war takeover in May 1937. Churches burning across Barcelona during the setmana tràgica, July 1909. July fireworks isn’t just a Spanish thing. This is the month when the Bastille was stormed and in which Belgium also gained its independence. Closer to the equator, Columbia, Venezuela and Peru all gained their independence in July while the Sandinista and Cuban revolutions exploded. Argentina’s independence further to the south, where it was winter, puts a dent in my theory that it is the heat that makes this such a volatile month. Last year in Barcelona, the 15-M movement of indignados – inspired by the book Indignez Vous! By Stephane Hessel, one of the fathers of the Universal Declaration of Human Rights – was a response to Spanish political events that have seen many people become angered and disillusioned with Spain’s out-of-touch political party system in the context of the ongoing economic crisis. In May and June, we thought great events were afoot. However, by mid-July, it seemed that everyone had slunk off to lie on the sand. This year, things seem to be following a similar path. Early in the month, Rajoy’s government introduced the harshest set of cutbacks and revisions that this young democracy has ever seen, sweeping away many of the rights and advances that unions and workers fought desperately throughout most of the twentieth century to win. Now July is almost over. While the continual protests and demonstrations have settled into a certain routine, no revolution is yet apparent, but it is a scorching day… so I am off to the beach.